President's meeting with King Abdullah II of Jordan. 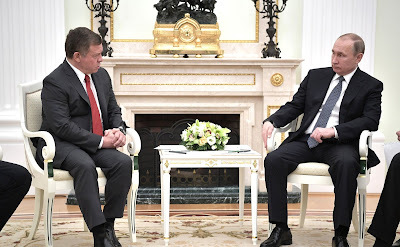 Putin.BLOG Foreign Policy Jordan President's meeting with King Abdullah II of Jordan. Vladimir Putin met with King Abdullah II bin Al-Hussein of the Hashemite Kingdom of Jordan, who came to Moscow on a working visit at the invitation of the Russian President. The discussion focussed on current issues in Russian-Jordanian cooperation and prospects for expanding trade, economic and humanitarian ties, as well as on current international and regional issues. Your Majesty, friends, welcome to Moscow. I am greatly pleased that our dialogue steadily continues and that we are always in contact. In the course of your visit today we will certainly talk about bilateral relations and the situation in the region, naturally, with a focus on sore spots, including efforts to reach a settlement in Syria. At the beginning of our conversation I would like to thank you for supporting the process that began in the capital of Kazakhstan, Astana. Thanks to our joint efforts, the process is developing on the basis of a very important decision that was taken – the cessation of hostilities, a ceasefire between government forces and the armed opposition. I consider it very important to note that the participants in the Astana process have declared that it is impossible to resolve the Syrian problem by military means. And we very much hope that the Astana talks will serve as a sound foundation for the continuation of this negotiating process also in Geneva. Mr. President, I am truly delighted to be back and seeing my brother and my friend again here in Moscow. And I cherish not only the special relationships that we both have, but the special relationship between out two countries. I am looking very much forward to our bilateral relations and discussions this evening on many issues where Russian plays such a pivotal role, not only internationally but specifically in our region. We fully endorsed and supported the Astana process and we are very grateful for Russia’s role in being able to do this, because this will bring, I hope, an inclusive future to all Syrian people. Again, we will work very closely with you as we proceed to the Geneva talks and other talks, and the role of Russia can only help advance the challenges, because without Russia we will not be able to find solutions to not only the Syrian problem but other regional problems in the Middle East. We both said many years ago that the challenge that our countries face, that the world faces, is this war on international terrorism. We have been speaking to many in the world who have not listened to your views and our views. But I am glad that I’m here today in Moscow to share not only the friendship but the same vision of bringing stability to our region. I thank you, Mr President, for allowing us to be here with you today. 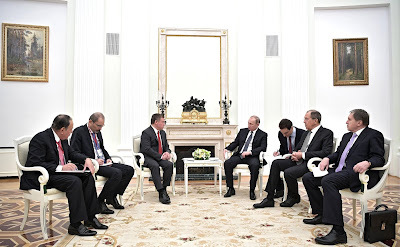 Vladimir Putin meeting King Abdullah II of Jordan. 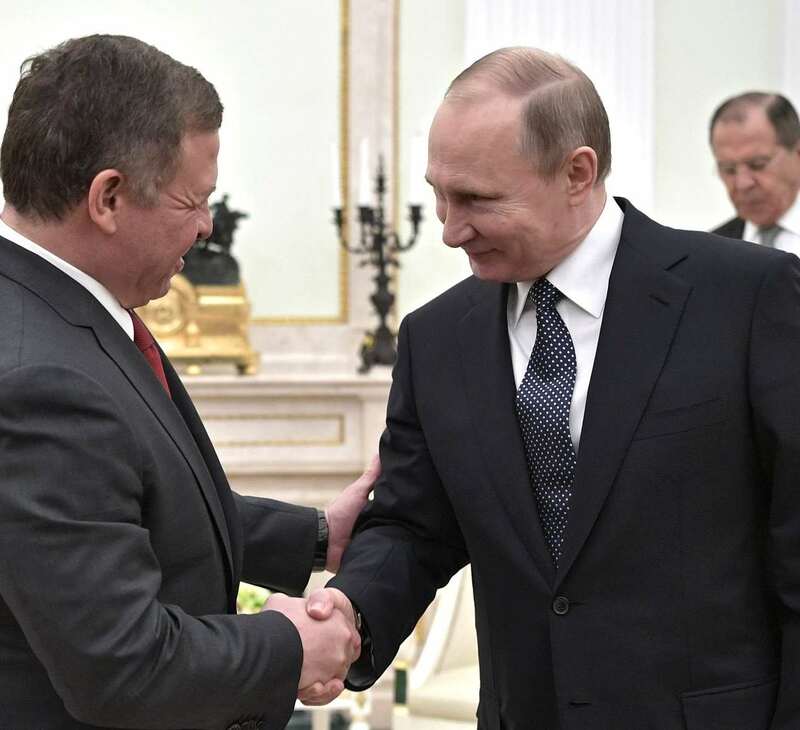 Vladimir Putin and King Abdullah II of Jordan. Russian President and the King of Jordan in Moscow. 0 Comment to "President's meeting with King Abdullah II of Jordan."